Paradise Lost, Paradise Reborn, Will it be Lost Again? They are only one or two inches long, but their mere presence is immense. The federally endangered Gila topminnow had not been seen in its native habitat, the Santa Cruz River watershed, for more than a decade. Then, in December 2015, what we all hoped for happened: they came back. Their numbers were small at first, but the annual fish survey one year later showed their population was not only established, but growing. Decades of pumping surface and ground water out of the Santa Cruz had dried up long stretches of the river. The sections that flow year-round relied on polluted wastewater that killed off the topminnow and many other living things. Federal Clean Water Act requirements, along with unrelenting pressure from conservation organizations, eventually led to treatment plant upgrades. The Sonoran Institute has helped validate that the cleaner wastewater, or “effluent,” has begun reviving the river’s natural habitat, and the topminnow’s return is a conservation triumph. It signals that years of effort to bring the Santa Cruz River system back from the brink are succeeding, and shows how remarkably resilient nature is if given a chance. Ironically, the success of effluent also spells trouble. As a resource, effluent has become as coveted as the fresh water it replaced. There’s growing demand to take effluent out of the river for human use, something that would threaten to undo the hard-won environmental gains. This is a story of second chances, of a little speckled fish that came back from the brink to survive in its native waters, of a habitat that humans ruined and then restored, and of a once-toxic waste now being used to sustain life. As a society, we’ve made so much progress in learning the importance of keeping water in the river. Are we really willing to repeat the mistakes of the past? From its headwaters in the San Rafael Valley in Arizona to its confluence with the Gila River north of Tucson, the Santa Cruz River stretches over 200 miles and is the only river to cross the U.S./Mexico border twice. It first flows south from its headwaters into Mexico, where it completes a 25-mile U-turn and flows back north into the United States (a stretch referred to as the “Upper Santa Cruz”), then through Tucson (the “Lower Santa Cruz”), and eventually into the Gila River, a tributary of the Colorado River. The river has been providing life-sustaining water to humans for more than 12,000 years. Unfortunately, over the last century, human demand for water has taken a devastating toll on the Santa Cruz. Surface water and groundwater have been pumped for drinking water, agricultural irrigation, and to fuel industry and commerce—to such an extent that much of the river has gone dry. Sections that do have year-round water are flowing because of wastewater inputs that until fairly recently were toxic to the river environment. A mass die-off of cottonwoods on an 8-mile stretch of the river in 2005 was a huge wake-up call. If the river stayed in such bad shape, the corridor of life it supported could be lost. In 2008, numerous research and monitoring efforts were taking place to understand the health of the river and to demonstrate how healthy rivers benefit people. The Sonoran Institute joined the effort when it became apparent we could play a critical role in synthesizing data being collected by multiple partners and create a report to that would provide a much clearer picture of the river’s condition and needs. To determine which indicators to track, we convened a science advisory committee of ecology, wildlife, and hydrology experts to bring the best available science to guide our Living River health assessments. The result of this collaboration was the first Living River report, which began with a baseline study to assess conditions in a 20-mile stretch of the river from Rio Rico to Amado in Santa Cruz County, Arizona, from October 1, 2007-September 30, 2008. These measurements were taken before completion of upgrades to the Nogales International Wastewater Treatment Plant (NIWTP) in Rio Rico, and conditions were pretty grim. “Poor water quality made it really challenging for fish and other aquatic wildlife. People couldn’t swim in the water because E.coli levels were elevated. We found a total of two fish in the river. Not two species of fish. I am mean two TOTAL fish!” says Zugmeyer. The two fish were native Longfin Dace. The federally endangered Gila topminnow were nowhere to be found. Poor water quality was also having an effect on riparian vegetation. High nitrogen levels had created a thick layer of algae on the bottom of the stream channel in some areas, preventing water from filtering down into the aquifer. As a result, the groundwater table in those areas had lowered out of reach for the roots of plants and trees. University of Arizona scientists found that this was the likely cause of the 2005 cottonwood die off. Bottom line: The river was stressed. And so were the people who cared about it. On the heels of the research effort into the tree die-off, we began coordinating an event where groups doing work on the river can come together for two days a year to share ideas and experiences. The first annual Santa Cruz River Research Days gathering was held in 2008. It has become a valuable forum for those interested in conservation efforts, both of the river’s natural and cultural resources. Back in 2009, there was still a lot of uncertainty about the benefits of effluent, and our 2009 baseline assessment showed why. In the next year, however, after years of activism by the FOSCR and others, the NIWTP in Rio Rico completed significant upgrades that reduced levels of nitrogen and other organic compounds in the effluent flowing into the Santa Cruz. Results of subsequent Living River assessments showed a river starting to recover. A year after the treatment plant upgrades, the number of fish counted rose from 2 to 142, and annual fish counts have tallied several hundred since then. While increasing fish numbers are a good indicator of a healthier river, other signs aren’t so easy to read. The river isn’t flowing as far in some spots as it used to, for example, probably because of better infiltration into the water table as a result of the reduced nitrogen levels. E. coli levels still exceed healthy levels after the upgrade, indicating other potential sources of contamination, such as from livestock near the river. Lack of rain and flooding also affect conditions from year to year. The system is complex, which makes our Living River work even more important. This success didn’t go unnoticed. The Living River reports for the Upper Santa Cruz caught the attention of Pima County, Arizona, which had undertaken its largest public works project ever, investing $600 million to upgrade two wastewater treatment plants on the Lower Santa Cruz, in the Tucson area. “We saw the success of the Upper River Santa Cruz work and wanted a way to educate the public, stakeholders, and decision makers about Pima County’s community investment and the improvements taking place at our Tres Rios and Agua Nueva reclamation plants,” says Evan Canfield of the Pima County Flood Control District. Together with Pima County, the Sonoran Institute since 2013 has been compiling Living River reports on the Lower Santa Cruz River, a 23-mile stretch northwest of Tucson. Modeled on those for the Upper Santa Cruz, these reports began with baseline measurements of conditions prior to the treatment facility upgrades, and have continued with annual assessments, tracking water quality, native fish, wildlife, and the overall ability of the public to enjoy the river. “The Living River reports simplify a massive amount of information about the river down to the most salient elements and present it in a way that is engaging and understandable to anyone, from government officials needing to make management decisions to children using it in their classroom,” Canfield says. Two education programs, the Living River of Words for students K-12 and Living River Academy for teachers, use the Living River reports as guides. Like those from the Upper Santa Cruz, the reports have shown improvements to river conditions from better-quality effluent. 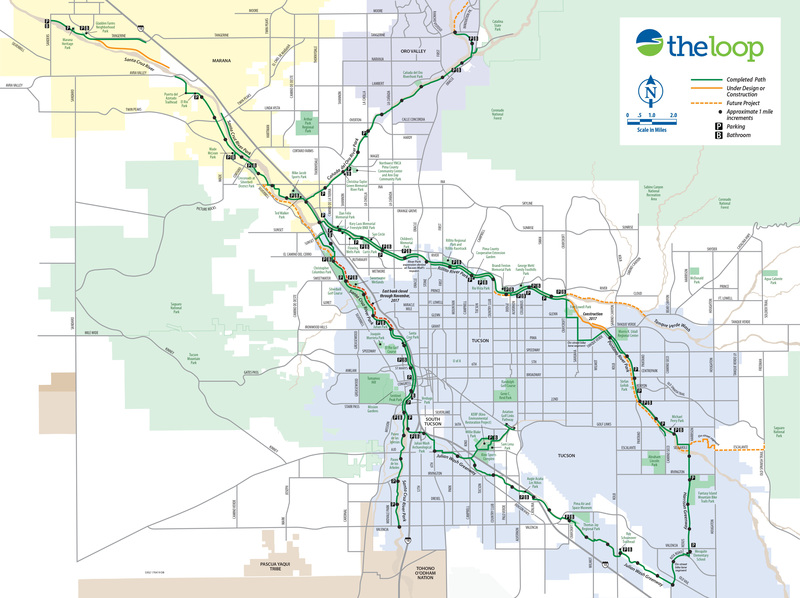 The water is clearer, there are four fish species living in the river (three more than in previous years), and people can enjoy walking or biking on the Loop recreation trail along the river in Tucson without the dreaded rotten egg smell. Nowhere is the Santa Cruz River’s history and cultural significance more visible than at the Tumacácori National Historical Park. Encompassing three 18th century mission sites near the U.S./Mexico border—Tumacácori, Guevavi, and Calabazas—the park celebrates the history of the native O’odham people, missionaries, settlers, soldiers, and others who spent time there, all because of the water in the Santa Cruz River. In 2002, the park’s boundary was expanded, and now includes a one-mile stretch of the Santa Cruz River. Thanks to the effluent that flows out of the nearby Nogales International Wastewater Treatment Plant, the Santa Cruz River in this stretch has surface-flowing water for most of the year, supporting an abundant diversity of plants and animals, including a cottonwood-willow forest, one of the rarest forest types in North America. It provides habitat for mountain lions, coyote, bobcat, deer, coatimundi, and javelina. It is also part of what Audubon Arizona has named an “Important Bird Area” for the density and diversity of birds it supports, including nesting Yellow-billed cuckoos, a species of conservation concern. All of this life has made the park and connecting Juan Bautista de Anza Trail, the two publicly accessible parts of the river in this area, increasingly popular with hikers, equestrians, and birders. Tumacácori’s mile of river is also one of the sites of the Gila topminnows’ comeback. For all the people who fought so hard for improvements to the NIWTP, participated in fish surveys, conducted water monitoring, counted birds, and all the other many conservation activities on behalf of the Santa Cruz River, the news of the topminnow’s return is exhilarating. It is also a clear sign of what highly treated effluent in the Santa Cruz and other effluent-dependent rivers can make possible. The success highlights what is at stake if the effluent goes elsewhere. The amount of effluent going into the river is at risk. Mexico has full rights to retain all of the wastewater that it currently sends to the US, which is more than two-thirds of the annual volume that is released into the river, and as of 2012 has constructed and expanded its own facilities to treat and keep its wastewater for domestic reuse in the state of Sonora. Connect with your river, support the future of the Santa Cruz.